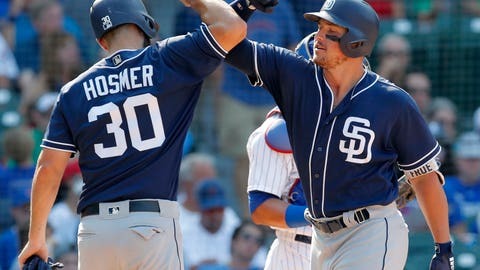 CHICAGO (AP) — Cubs ace Jon Lester was hit hard again and the San Diego Padres also battered Chicago‘s bullpen on their way to a 10-6 victory Sunday. Renfroe finished with three RBIs, helping the last-place Padres salvage a split of the four-game series after they blew a four-run lead in the finale. Spangenberg and Jankowski were inserted into the game as defensive replacements in the seventh inning. Craig Stammen (5-1) got the win despite allowing pinch-hitter Anthony Rizzo‘s tying single. One of the biggest problems for Lester has been the long ball, and it hurt him again on Sunday. Freddy Galvis golfed a leadoff drive just over the wall in left in the second, and Franmil Reyes opened the fourth with a massive shot to center that traveled an estimated 477 feet. The 34-year-old Lester has allowed at least one homer in each of his last seven starts. Getting him back on track could be the biggest key for Chicago as it tries to hold off Milwaukee in the competitive NL Central. San Diego also got a two-run triple from Eric Hosmer with two outs in the second. Joey Lucchesi struck out nine in 5 2/3 innings after his start was pushed back a day due to an illness. Javier Baez hit his career-best 24th homer and an RBI double for Chicago, which won five of seven in the season series against San Diego. Ben Zobrist added two hits after beginning the game on the bench, including his eighth homer in the ninth. The Cubs trailed 5-1 before pushing across two runs in the fifth and seventh. Albert Almora Jr. singled in Zobrist in the seventh. After Baez struck out, Rizzo drove in Ian Happ with a perfectly placed blooper into left field. Right-hander Trey Wingenter was promoted from Triple-A El Paso. The Padres said they will fill Lyles’ roster spot before their series opener against the Brewers on Tuesday night. Wingenter is looking to make his major league debut. He said he arrived in Chicago around 2 a.m., and his parents also made the trip from Huntsville, Alabama. Cubs: Yu Darvish (triceps and elbow injuries) could be headed for a simulated game after throwing 55 pitches in a bullpen session Saturday. But manager Joe Maddon said he wanted to check on how Darvish was feeling after the bullpen session before finalizing the next move for the right-hander. Cubs: LHP Cole Hamels (6-9, 4.53 ERA) starts the opener of a three-game series at Kansas City on Monday night. It’s Hamels’ second start since he was acquired in a July 27 trade with Texas. RHP Jakob Junis (6-11, 5.12 ERA) pitches for the Royals.